Thursday 14/03/’19 marks the end of the first Newbie Award Flanders. Eight nominees, all with equally interesting stories, joined the final conference in a Brewery near Leuven. Our final winner was Boer Olivier (EN: “Farmer” Olivier) who displays both a strong social media network, innovative production methods and a marketable story. Olivier joint the family farm. However, inspired through a more business oriented education, he recognized the opportunity of two innovative products: Nature Meat and eggs from a mobile hen-house. 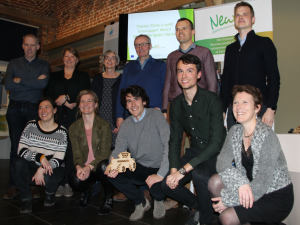 The Newbie team of Leuven invited all nominees to present their farms, the opportunities and challenges. It became a very inspiring evening, demonstrating that regardless the activities or the background of the new entrants, it is worth to exchange experiences. It was also remarkable that not just the agricultural press showed interest in this event, but even the popular press reported on this event. With climate change high on the Belgian’s political agenda, the Newbie team invests in bridging the communication gap between consumers and producers. 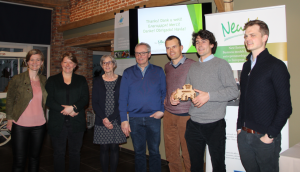 All nominees received the wooden tractor, created by the KU Leuven Newbie team, a nice memory of a successful first edition of the Newbie Award in Belgium.